Sprouted. Organic. Whole grain. Gluten-free. Vegetarian Society Approved. Vegan. Kosher - KLBD. Purest Porridge Oats These oats are as pure as can be. Normally oats are streamed before being turned into flakes, but our sprouted oats are simply rolled - that's it. 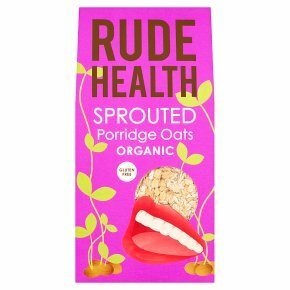 This means that the flavour is more oaty and complex, the texture is creamy but with a delicious bite. Why sprout? What's more nourishing than a grain? A grain that's been sprouted. Dormant food An unsprouted grain is dormant, waiting for the right time to germinate. Its nutrients are locked up and well protected, making dormant grains harder to digest. Sprouting When soaked in water, the grain wakes up and starts to sprout. Enzyme activity breaks down growth inhibitors, transforming and multiplying nutrients into their more easily digestible forms. Preserving the nourishment The sprouted grain is slow dried to preserve its valuable nutrients. Then it's rolled, creating these raw, wholegrain, gluten free sprouted porridge oats, ready to use. Cooking Instructions Be patient, the longer you cook these oats the better they will taste. For best results cook on the hob. 1 cup of sprouted oats 2 cups of milk or water Pinch of sea salt, if you like In a Pan: Bring to a boil and simmer for 12-15 minutes until most of the water has cooked down, stirring occasionally. Microwave: Pour the oats & half of the liquid into a bowl. Cook on full power for 2 minutes then stir. Add half the remaining liquid, cook for 1 minute then stir. Add the rest of the liquid, cook for 1 minute then stir and leave to cool and thicken for a minute.